Famous celebs like Kanye West and Britney Spears have had cameras following them for years. It makes sense that after all this time they've gotten fed up. Here are some cases where stars got physical with the paparazzi! While trying to read outside a shop in Washington, D.C., Shia was repeatedly heckled and harassed. Tired of one photographer's presence, the star sprinted at the paparazzi, threw coffee on him, and proceeded to run away down the street. 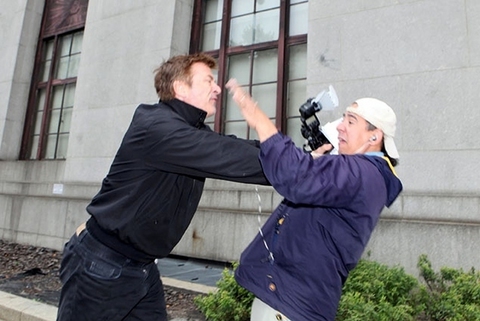 Like Sean Penn, this celeb has gotten physical with the paparazzi more than once. In 2008 as Martin and his pregnant wife, Gwenyth Paltrow, existed the hospital, he grabbed a paparazzi by the collar, shoved him to the ground, and took his camera. The man quickly got up and lunged at the singer, struggling to get it back. The aggravated star proceeded to tell them to "have some respect," but eventually gave it back. Tired of being taunted and bothered by a photographer accusing him of cheating, Khloe Kardashain's hubby lashed out in July of 2013. After the photographer snuck through a gated area and violated their private property, Lamar took action into his own hands. Throwing camera supplies out of the pap's car, NBA star damaged his equipment and smashed a car window. As we know, this celeb hasn't always had the best of luck when it comes to his temper. There have been several instances in which he has physically and verbally assaulted photogs. While leaving the courthouse with his fiance, Hilaria, Baldwin struck a photographer and later tweeted using the hashtag "#allpaparazzishouldbewaterboarded." Constantly in the public eye, it's no surprise that Lindsay lost her cool in 2008 while surrounded by photographers. Believing that one of them tripped her, she retaliated by punching him in the face and said, (talking on her cell phone) "Oh my God, I just hit a paparazzi." While married to Katy Perry in 2010, Russell didn't take to kindly to some intrusive crowds at LAX. After shoving several photographers and their cameras on the way to their terminal, Brand was arrested for the alleged battery. Paying his $20,000 bail, Brand was able to leave later that day. While hanging out with friends at the beach in 2010, Adam got into quite a scuffle with a photographer. After almost an hour of nagging, rude insults, and getting way too close, the singer attempted to take his camera. The paparazzi pressed battery charges against him, however, they did not stick. In March 2007 this singer got into a tumble with photographers while leaving a London nightclub. Several photos show Lily punching and high kicking as she tries to flee the scene. The star has also been seen throwing water bottles, snowballs, and slaps. Over the years, Sean Penn has made no attempt to hide how much he hates the paparazzi. His most aggressive incident occurred in 1986 while the star was shooting a film in Macao, China. Upon finding a photographer hiding in his hotel bedroom, Penn allegedly dangled the man from his ninth-floor balcony. Although he was charged with attempted murder, he fled the country before he could be arrested. There have been several instances in which this aggravated celeb attacked the pesky paparazzo. While in London in 2007, Grant was arrested for kicking a videographer and hurling a container of baked beans at him, stating, "I hope your kids die of f**king cancer." The charges were eventually dropped, however, Grant's violent behavior towards the paparazzi has remained the same.